Berry Petroleum entered an agreement on October 25 to purchase 9,300 acres in the Wolfberry trend for $180 million. This deal is valued at $19,354/acre. Energen Resources Corporation signed an agreement on November 1 to purchase 10,360 net Wolfberry acres for $75 million. This deal includes six producing wells and is valued at $7,239/acre. 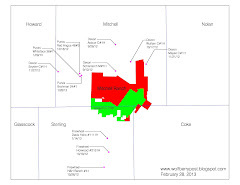 Also on November 1, Approach Resources acquired 5,033 net Wolffork acres for $21.5 million ($4,272/acre). The asset inlcudes 470 boe/d of current production. PDC Energy announced on November 3 that it entered into an agreement to acquire 5,760 Wolfberry acres for $40 million ($6,944/acre). This deal includes six wells. Clearly, this flurry of recent activity is bringing a lot of attention to the Wolfberry Play in West Texas. Lynden Energy Corp. (LVL) has over 5,000 acres in their Wolfberry core area and a 50% interest in the 101,495 acre Mitchell Ranch. It appears that it is only a matter of time before LVL's stock price sees a significant rise!